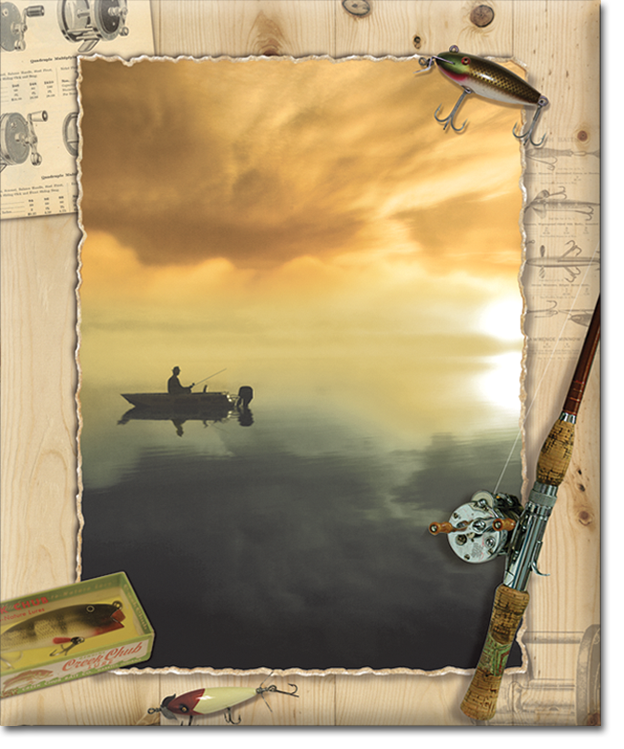 The Angler's Glory fishing series is a fitting tribute to anyone who enjoyed casting a line. 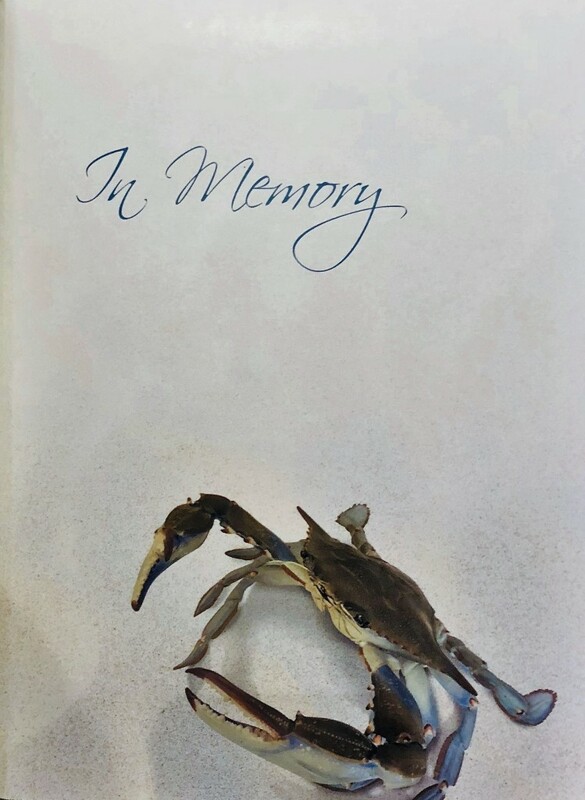 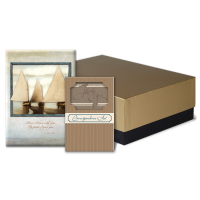 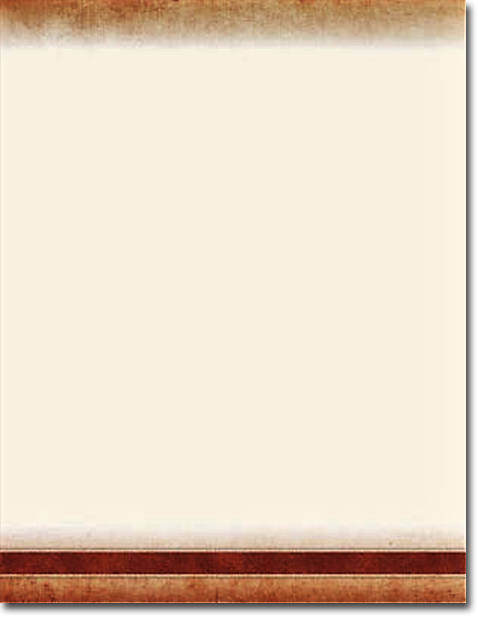 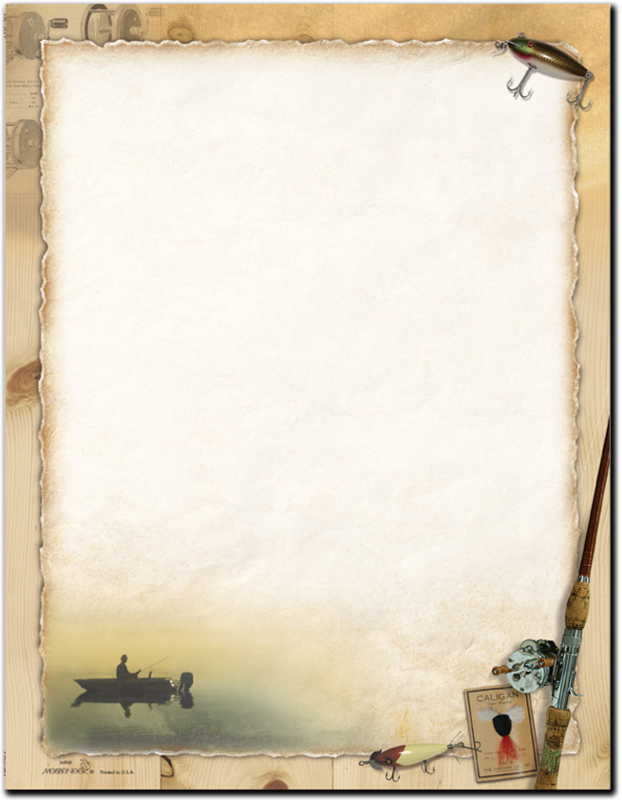 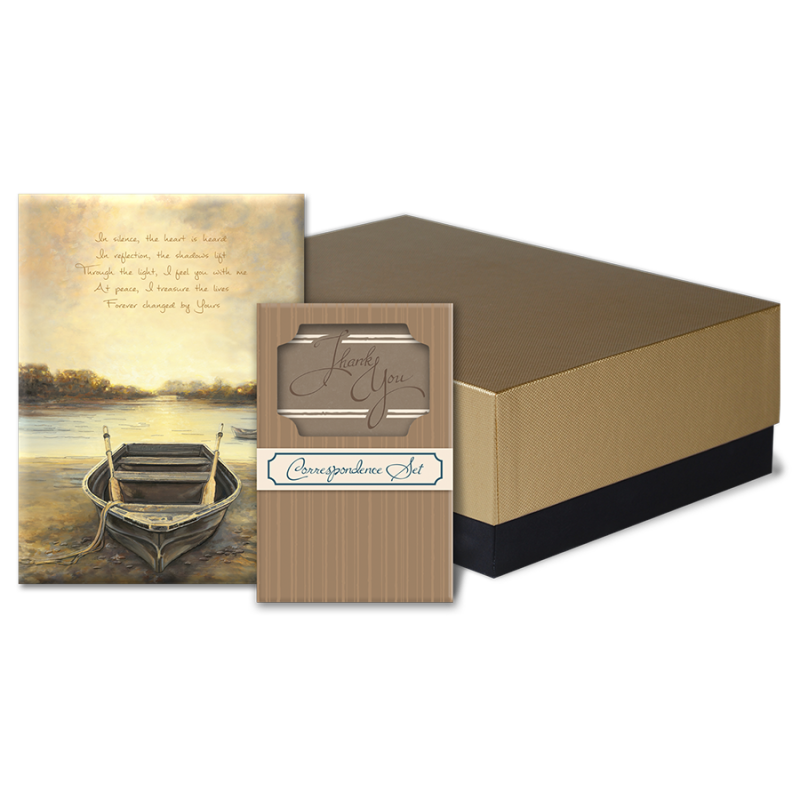 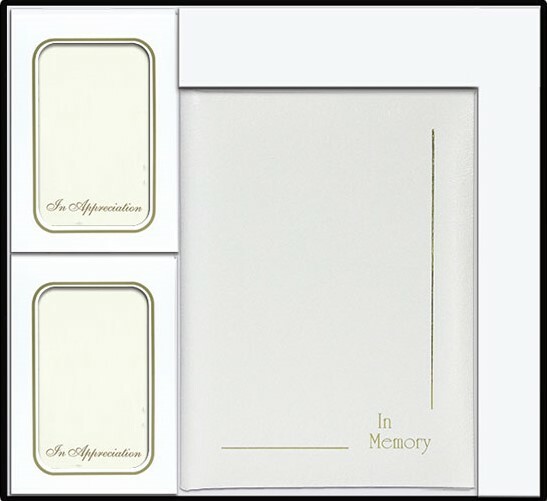 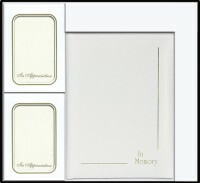 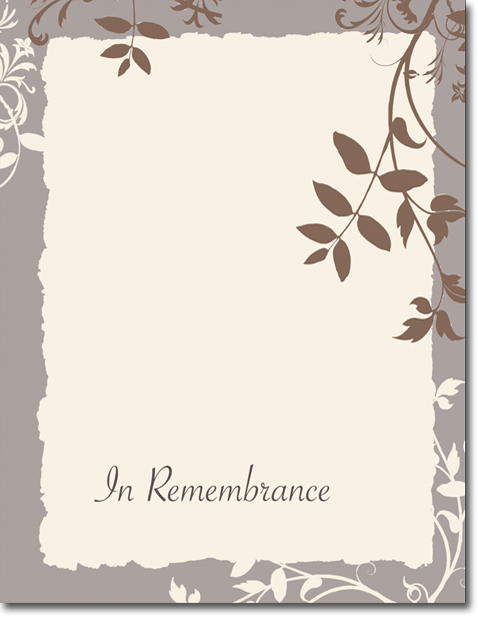 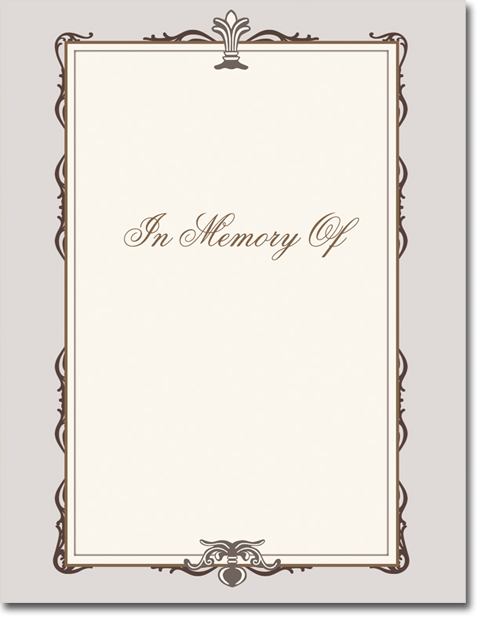 The memorial register book features a rustic knotty pine background with a full color photograph featuring the silhouette of a person in a boat on peaceful waters. 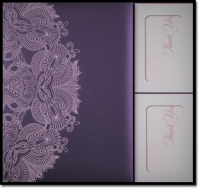 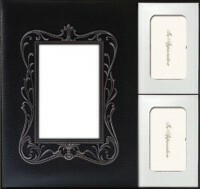 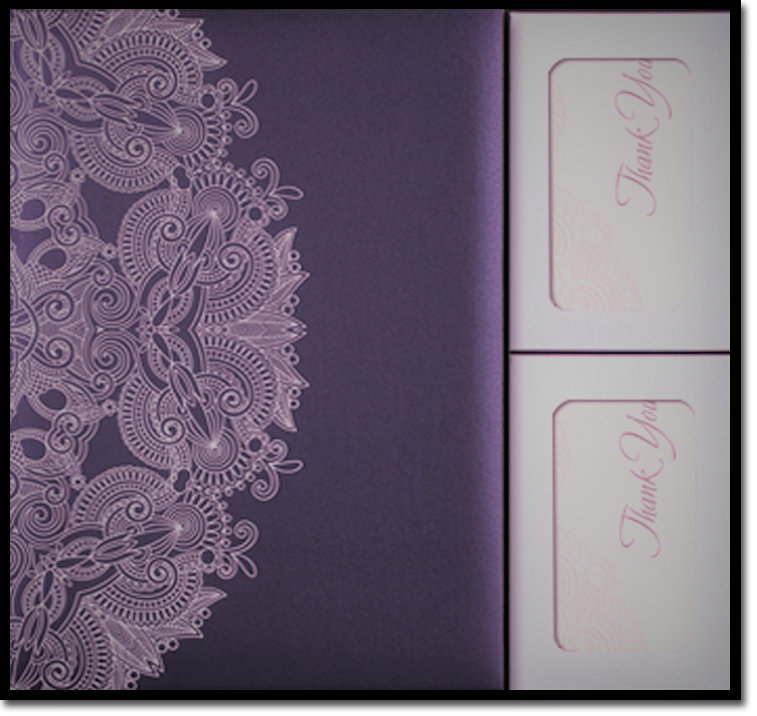 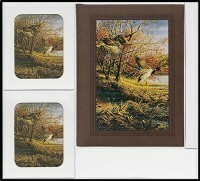 The cover also adorns fishing embellishments that are beautifully embossed for added detail. 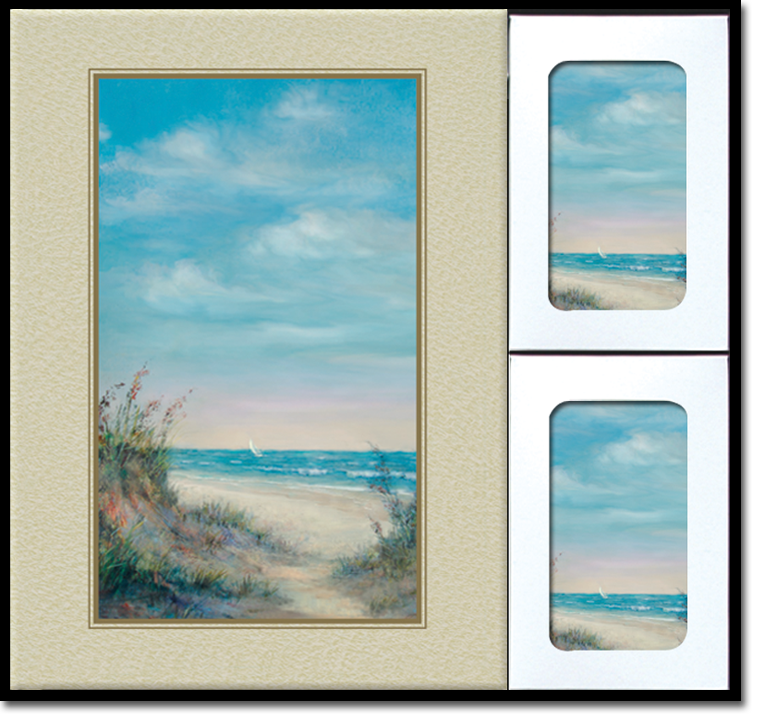 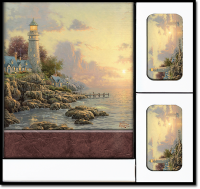 This design features a tranquil scene where a group of sailboats drift together across peaceful waters. 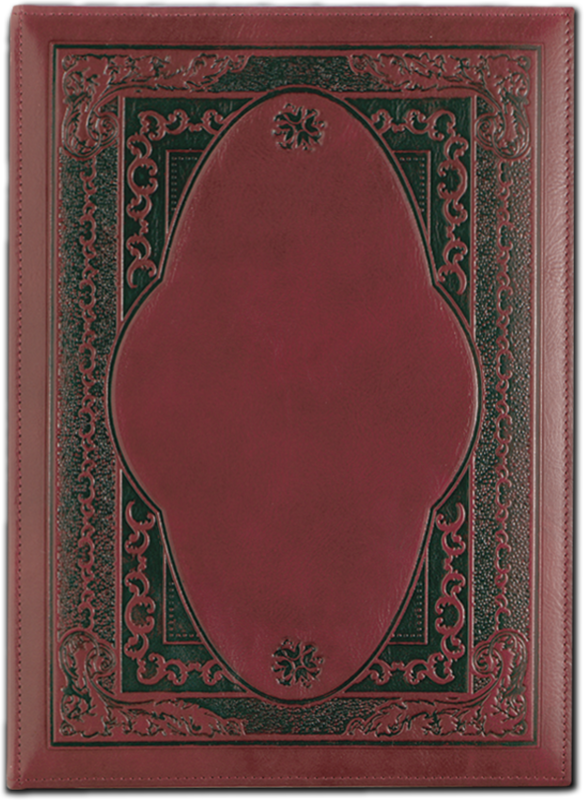 Comforting words of Scriptures are printed throughout the series, offering a message of reassurance. 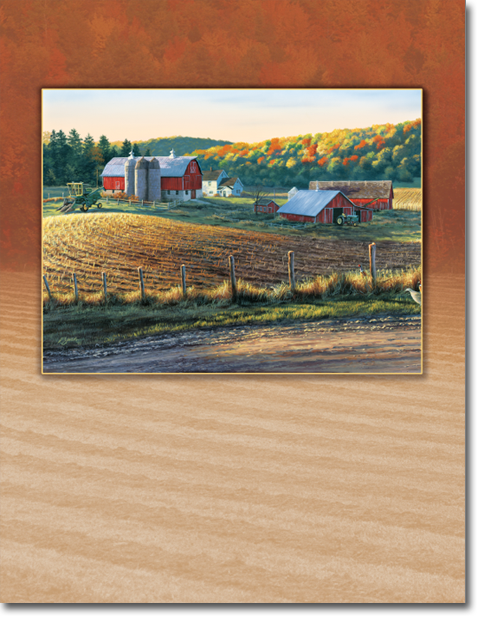 Celebrate the rich agricultural heritage of North America. 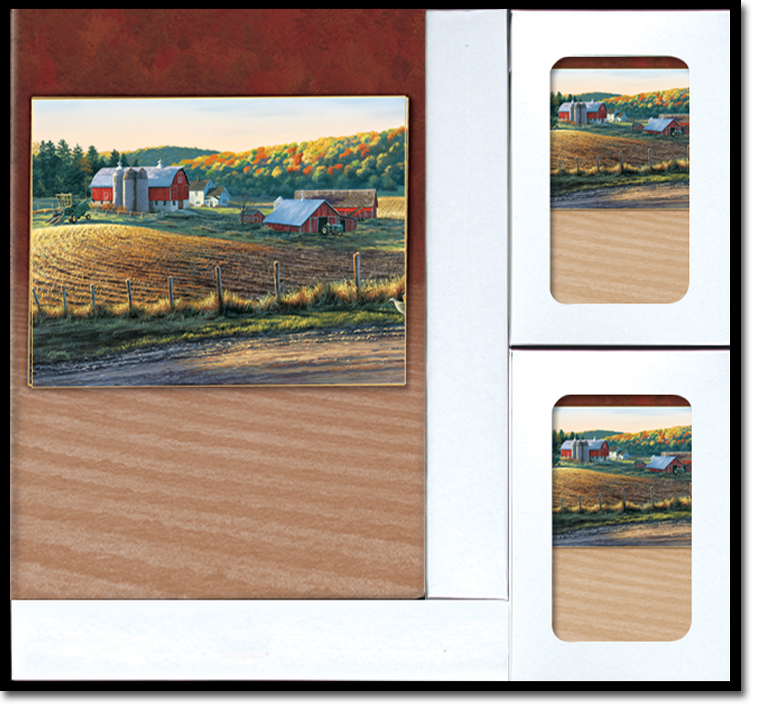 A timeless farm scene flowing with color warms the heart with special memories of a nourishing country and bountiful harvests. 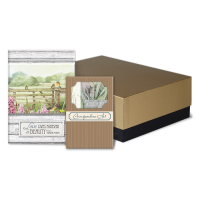 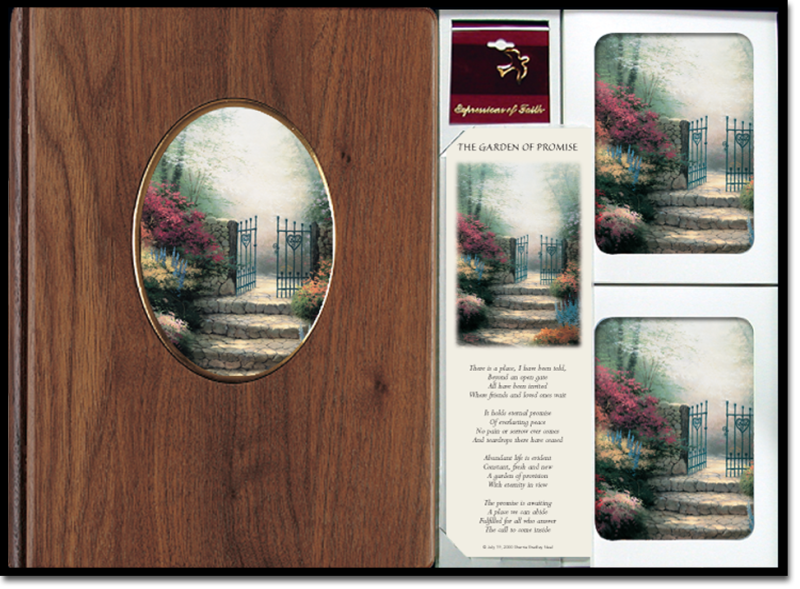 The Batesford Cherry Register Book Set is beautiful cherry wood with an elegant interior. 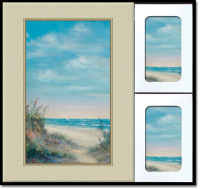 The Beach series, featuring artwork by Lena Liu, showcases beautiful golden sand dunes overlooking a peaceful blue horizon. 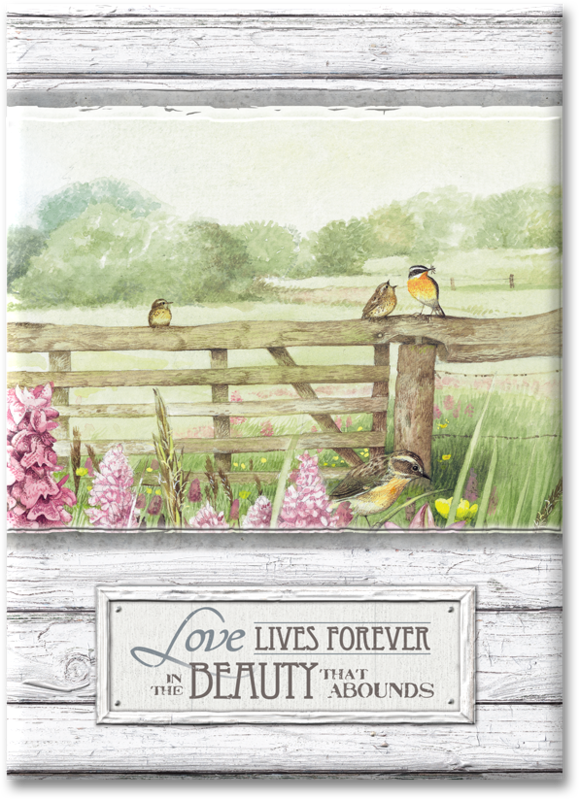 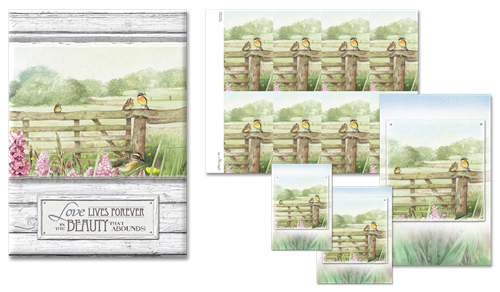 This design, from artist Marjolein Bastin, features a peaceful meadow complete with lively birds and blooming orchards. 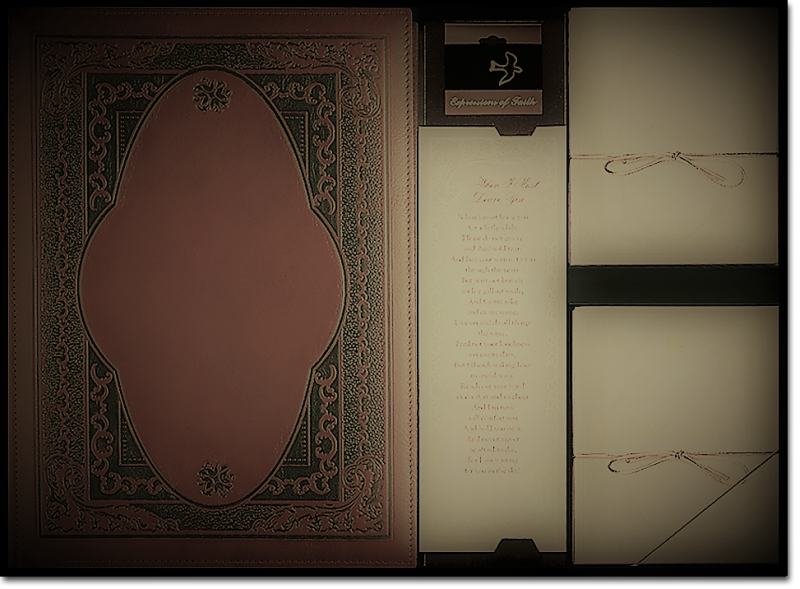 Original poems are printed throughout the book’s gallery pages. 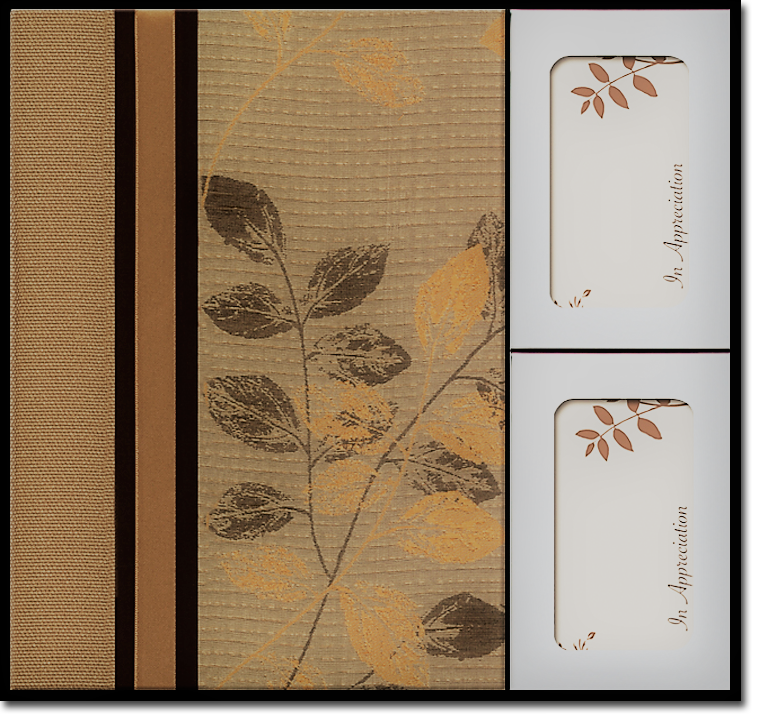 The classy style of the Café Shimmer Series is sure to appeal to those with refined taste and sophistication. 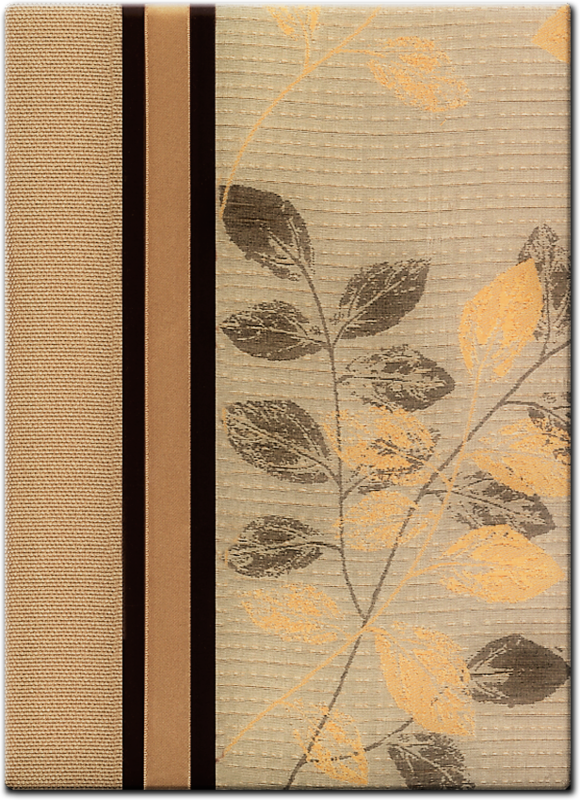 The book cover, handcrafted by Molly West, features luxe brown and gold leaves richly printed on textured silk. 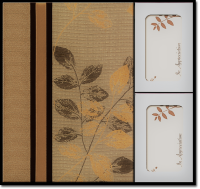 The blend of velvet and satin ribbon and metallic woven fabric gives this book an exquisite and sophisticated palette. 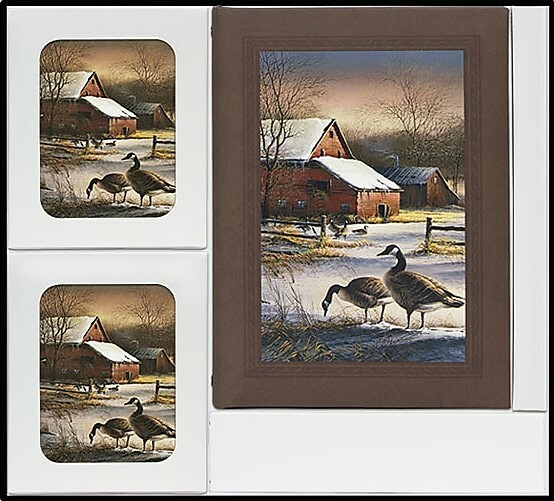 The subtle color changes of the book fabrics and attention to detail throughout the series truly makes it a piece of art. 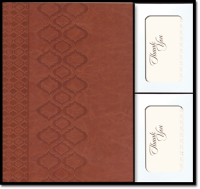 With its cowhide cover and debossed accents, Cambridge is both classic and modern, and carries an air of distinction that will appeal to the generations of both today and tomorrow. 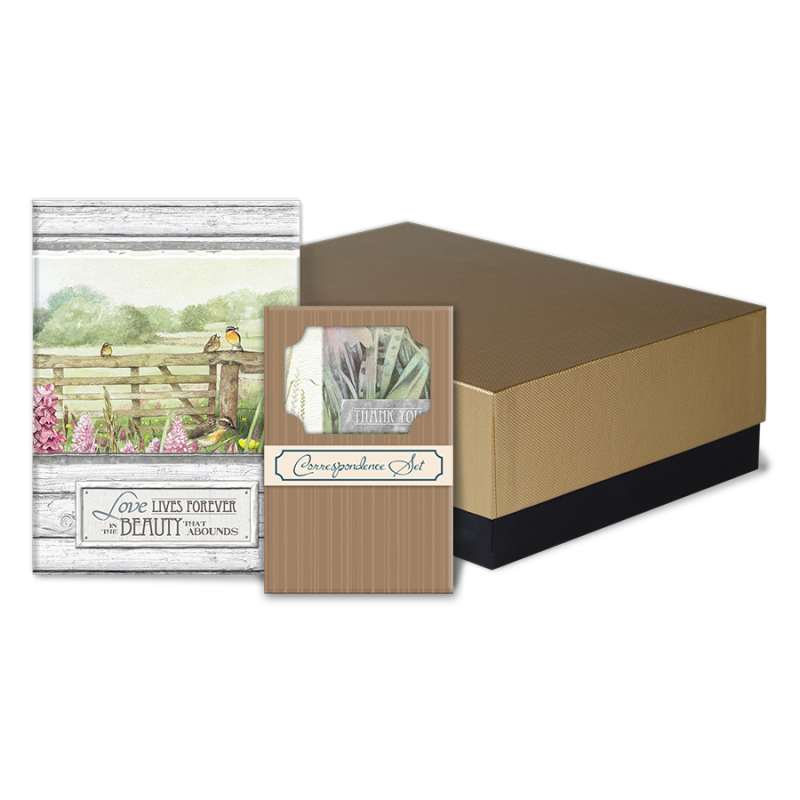 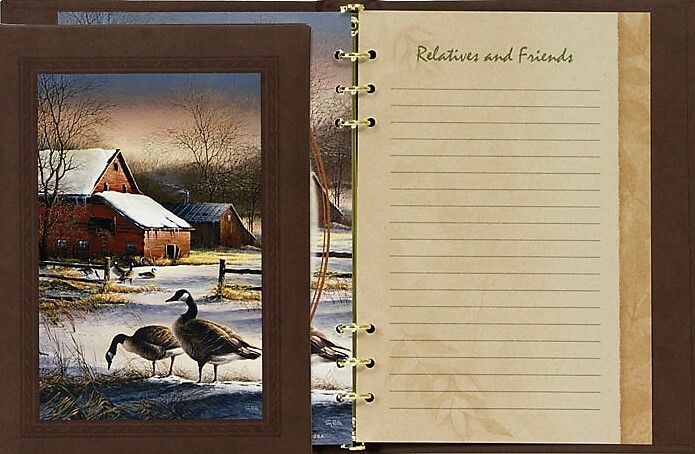 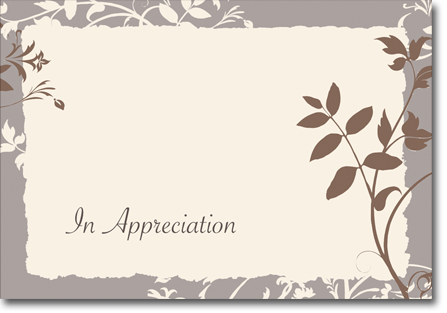 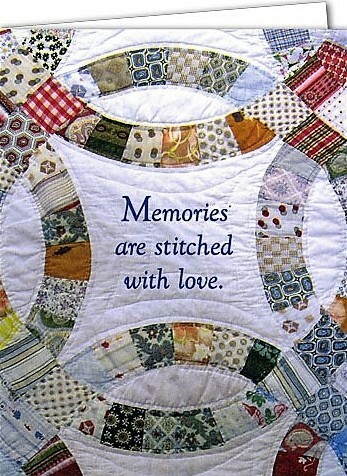 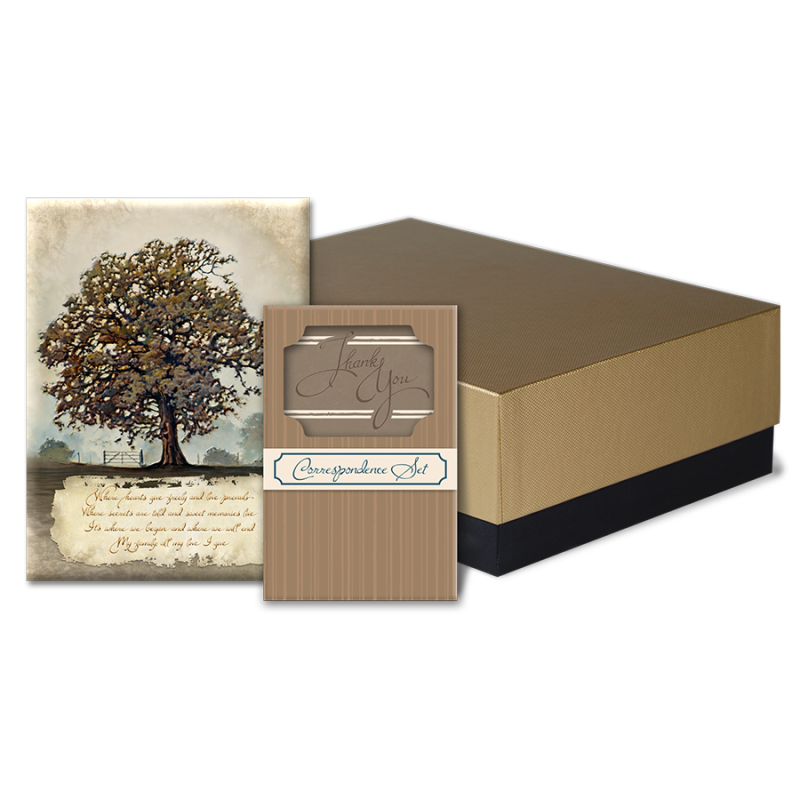 The Family Tree register book package is designed to evoke warm memories of home and family. 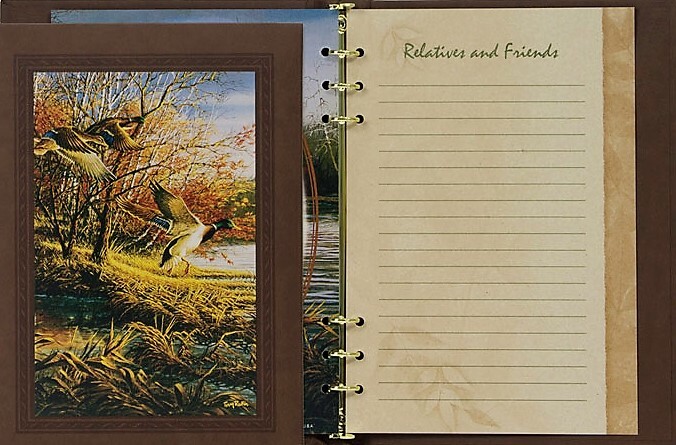 Warm browns and earthly greens invite the nostalgia of growing up and growing old surrounded by love only family can provide. 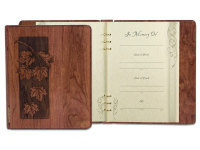 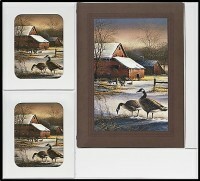 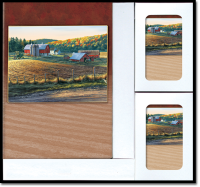 Beauty and craftsmanship are evident in our Inlaid Ceramic Tile Wood Books made of solid Walnut. 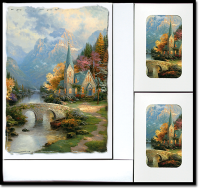 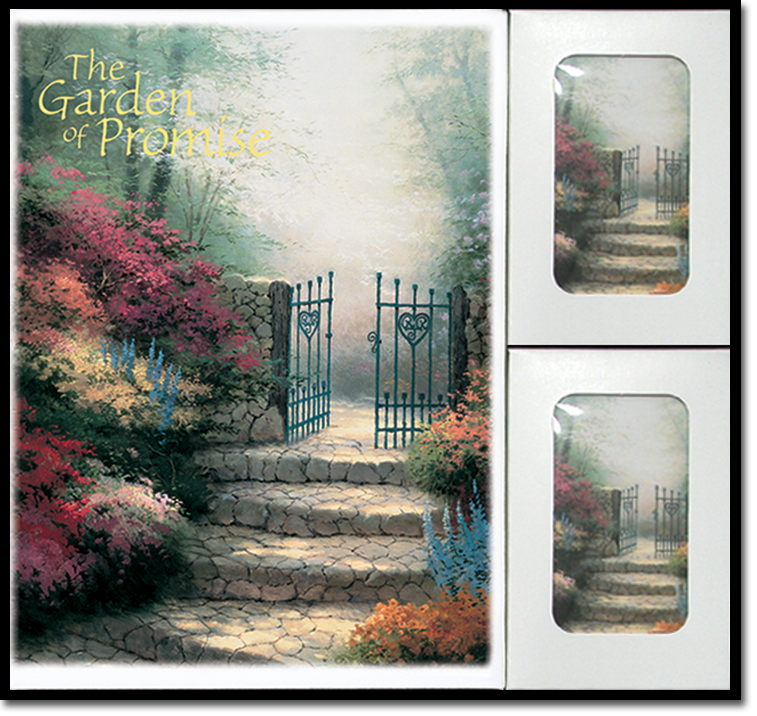 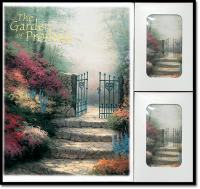 This finely crafted book features an embedded oval, kiln-fired ceramic tile displaying the “The Garden of Prayer” artwork by Thomas Kinkade. The Gardener’s Glory series is simply breathtaking and is a beautiful tribute to those who enjoyed spending time in the garden. 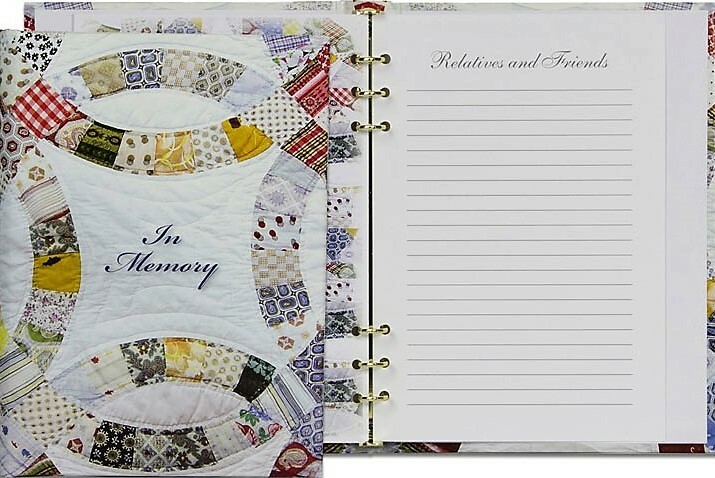 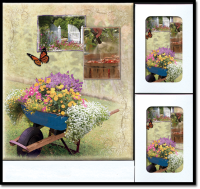 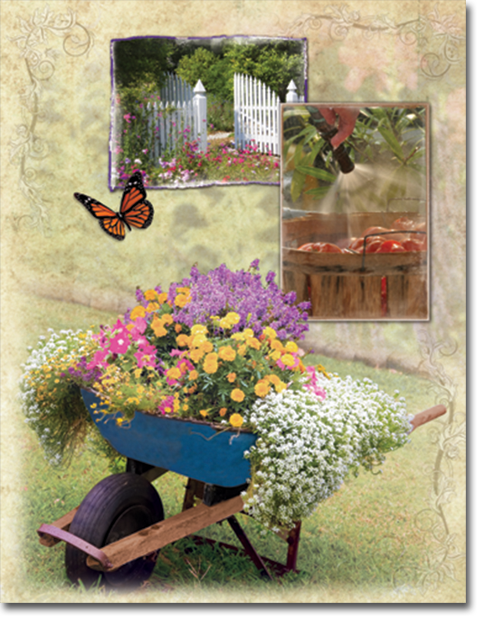 The memorial register book features a collage of garden photography and is skillfully embossed to add welcome detail to the colorful images. 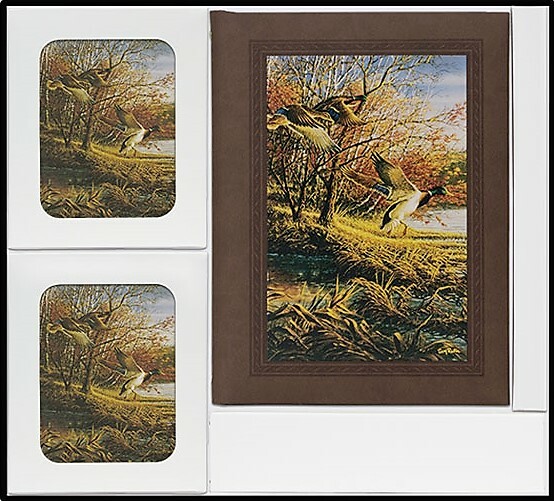 Breathtaking mountain scenery is featured on the cover of this register book. 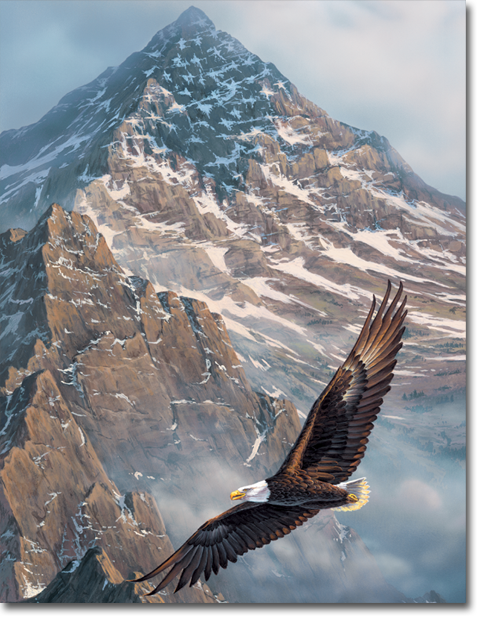 Majestic rocky peaks stretch high above a valley below, and a vibrant burst of sunlight shines at their summit. 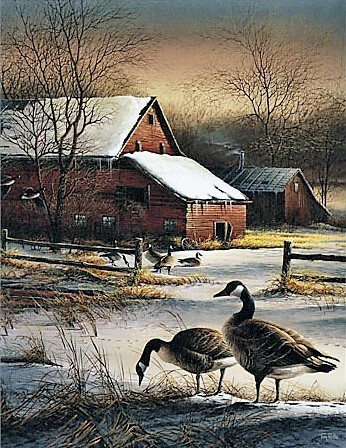 The series derives its name from the popular country song, whose uplifting lyrics are featured on the book cover. 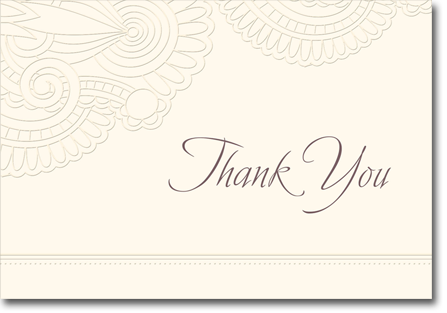 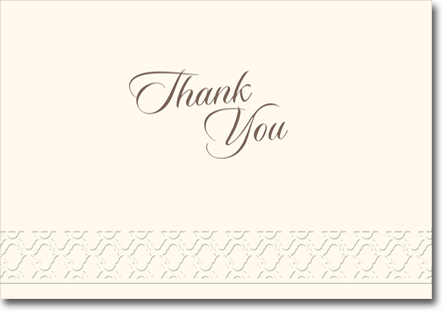 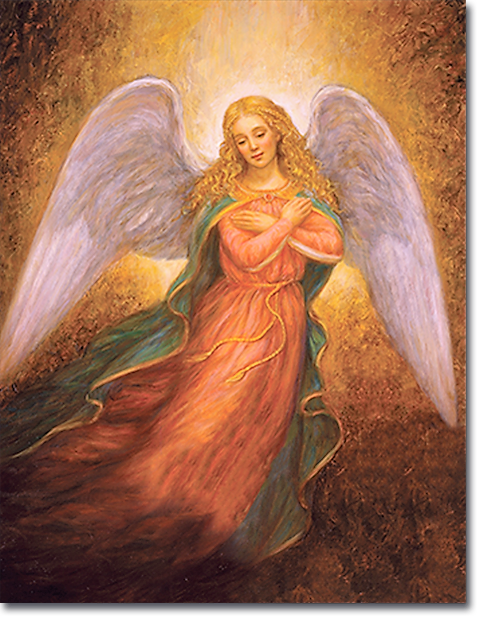 The English word “angel” comes from the Greek Angelos, which means ‘messenger’. 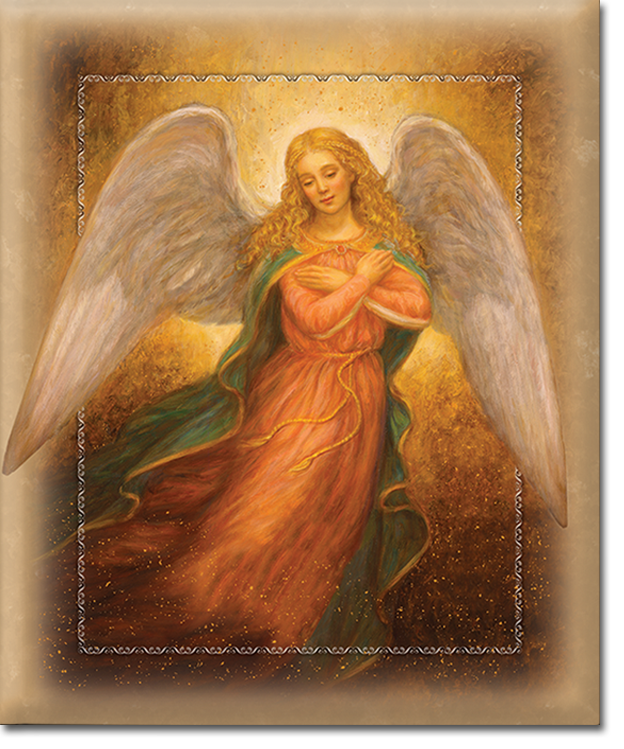 Many people believe that angels are pure spirits created by God to be the ministers of His will. 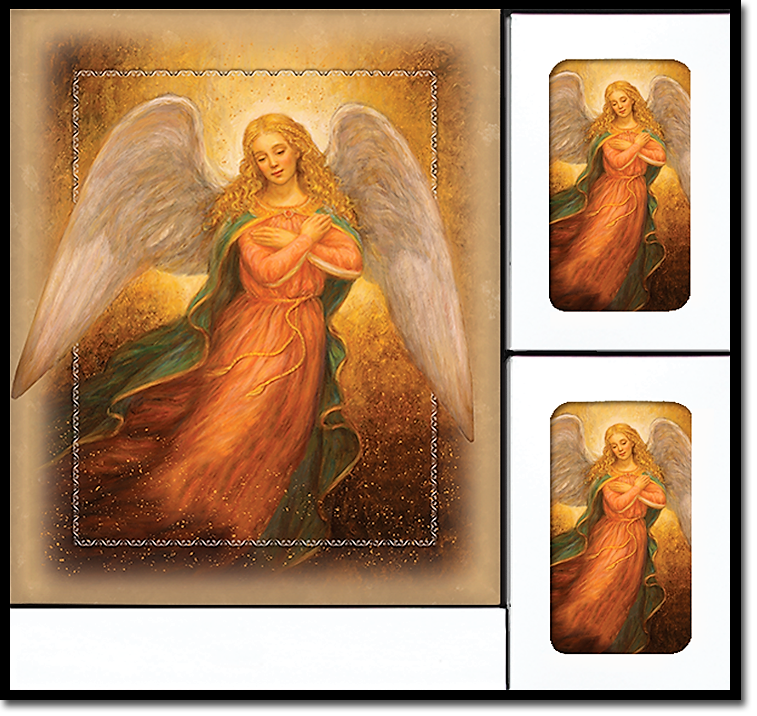 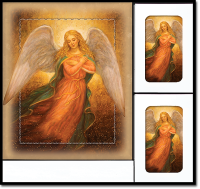 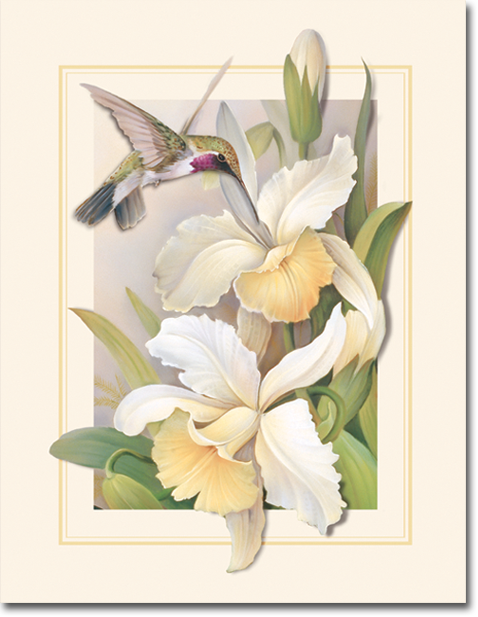 This new angel series, featuring artwork by Edgar Jerins, is a beautiful and peaceful interpretation of God’s divine messenger. 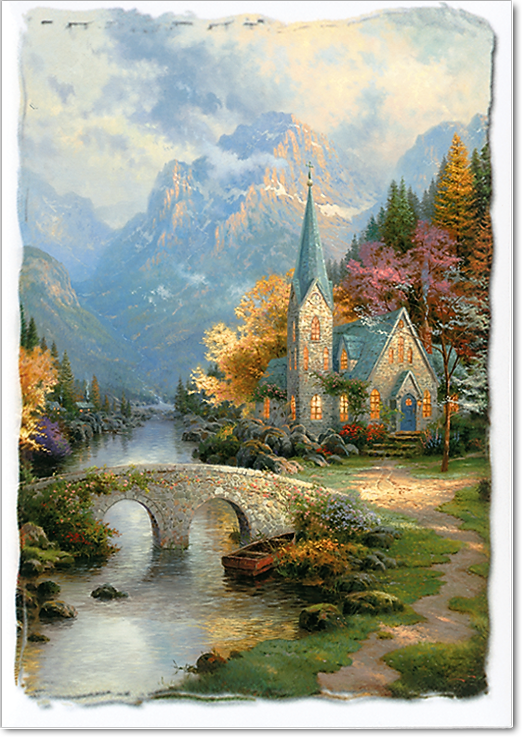 A quaint chapel nestled at the foot of the mountain – a quiet place to calm one’s heart. 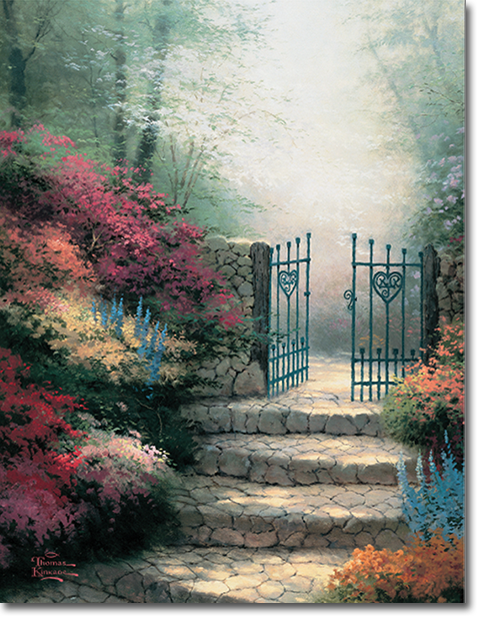 Welcome to Heaven’s backyard. 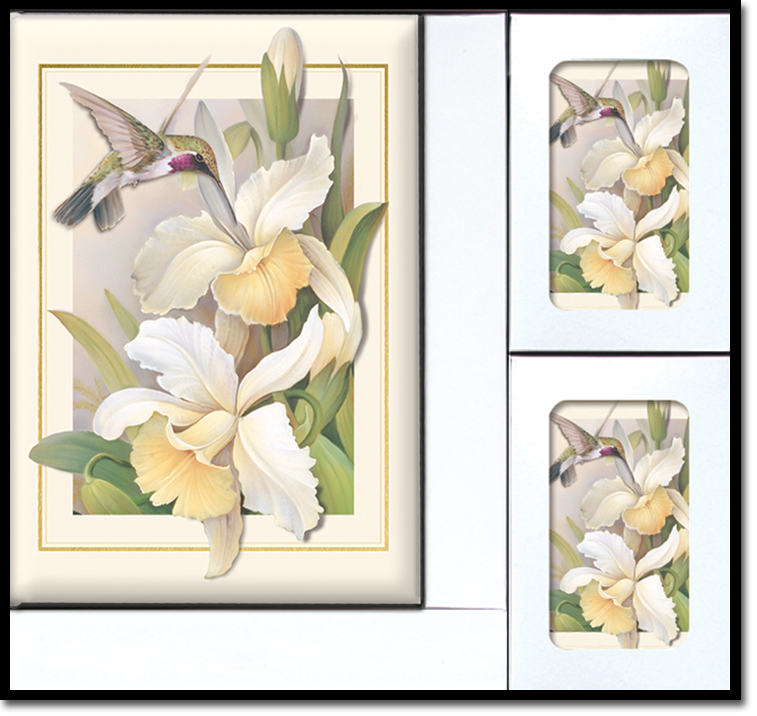 “Nature’s Flight” features colorful artwork by Russian artist Oleg Gavrilov, bringing to life visions of a peaceful garden alive with Heaven’s creations. 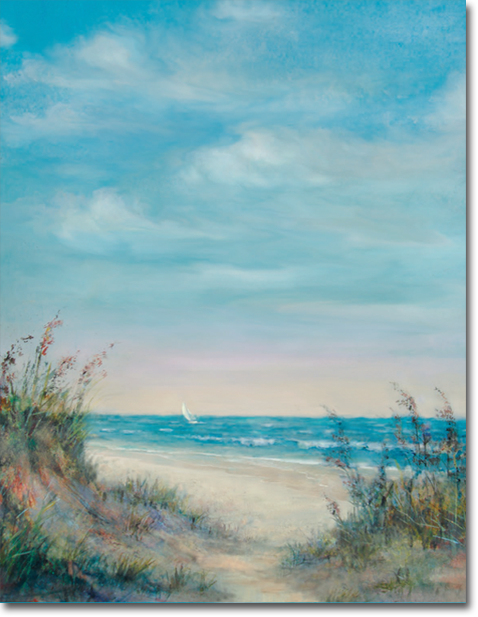 Sherrie Bradley Neal compliments the art with two new poems. 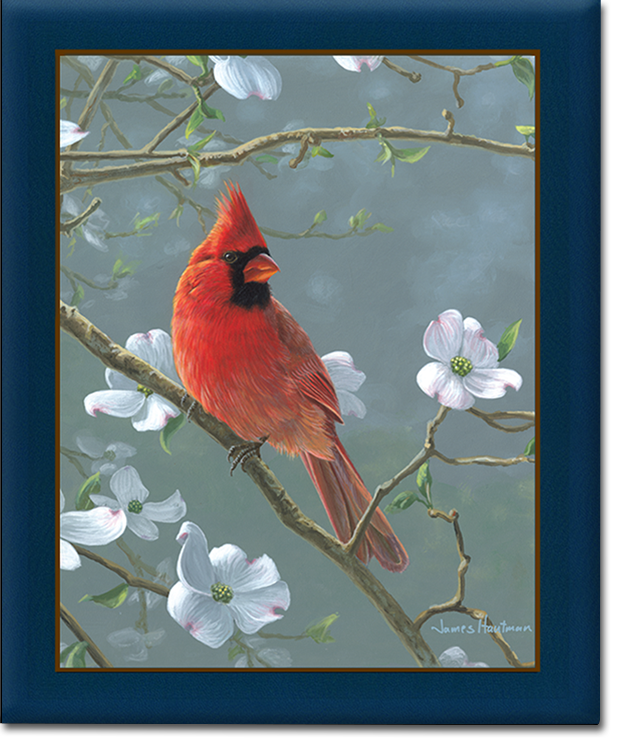 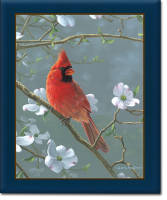 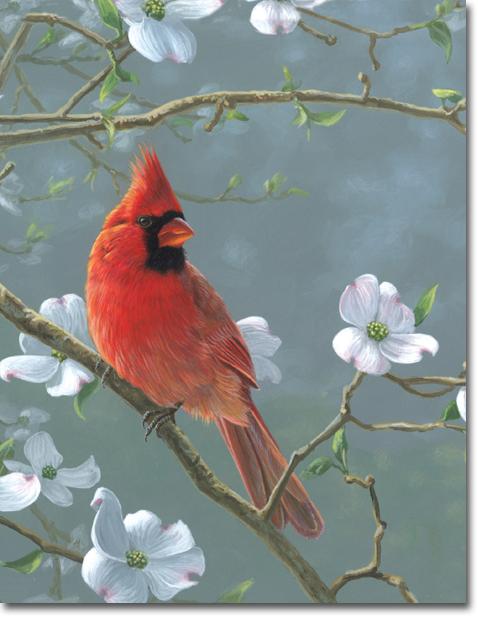 Its magnificent color, captivating crest, or perhaps its sweet song – whatever the allure; the Northern Cardinal series is a fitting tribute to anyone with a fondness for these charming creatures. 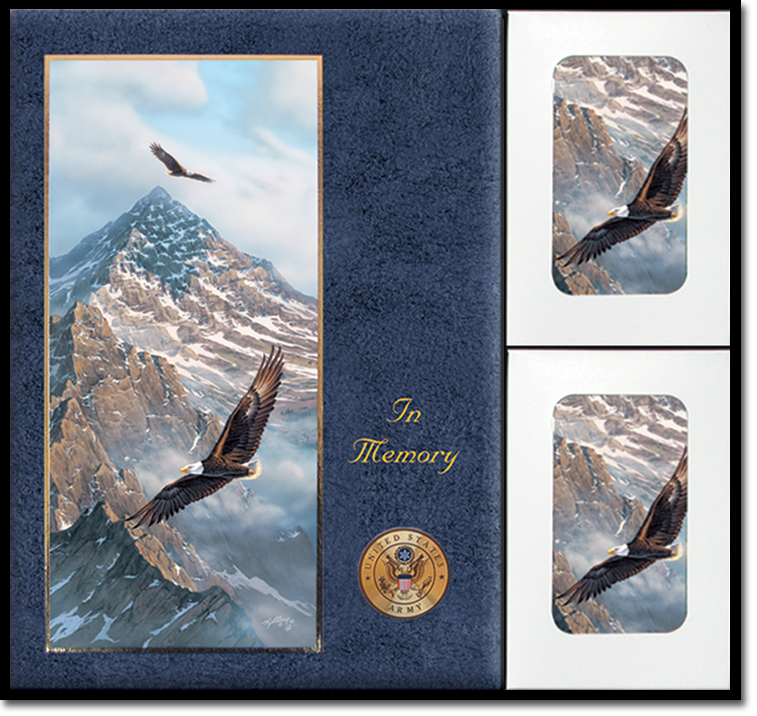 The majestic and emotion-filled art of Rick Kelley is featured in this patriotic commemorative series. The powerful art was inspired by the horrific events of 9/11 and features two of America's most meaningful symbols, the Bald Eagle and the American Flag. 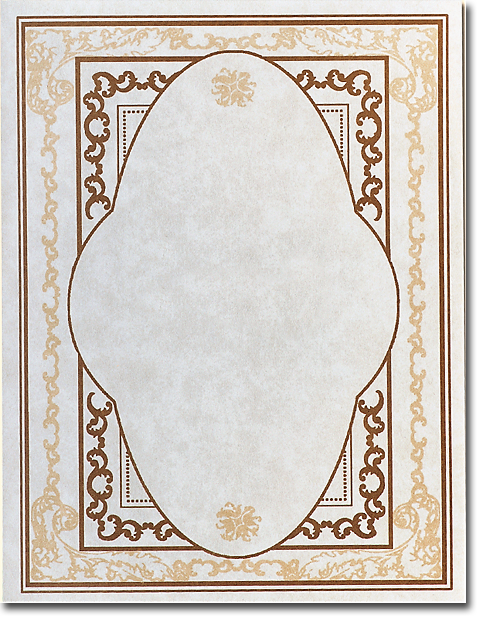 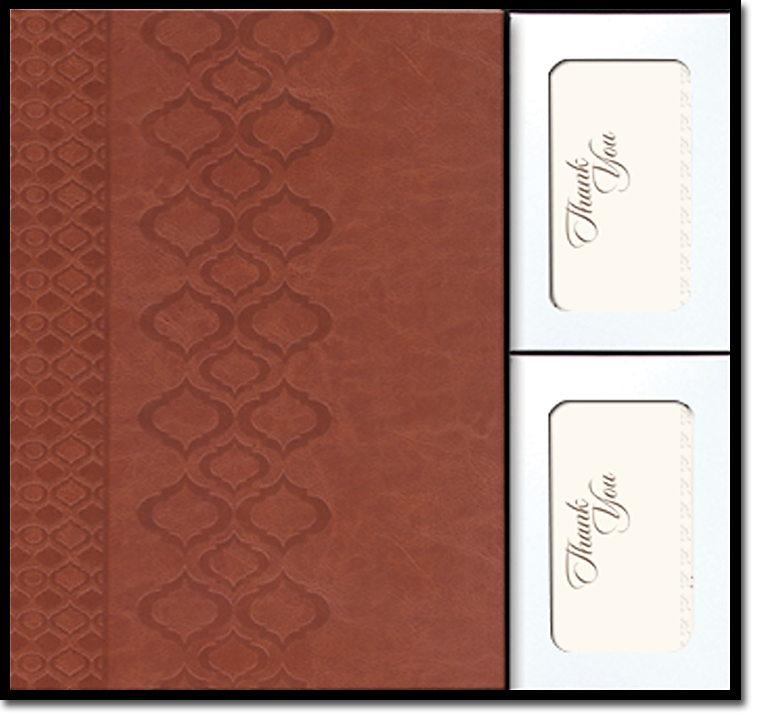 Simply a classic…Hand-stained genuine split leather with the finest parch tone paper, embossed and stamped with gold foil. 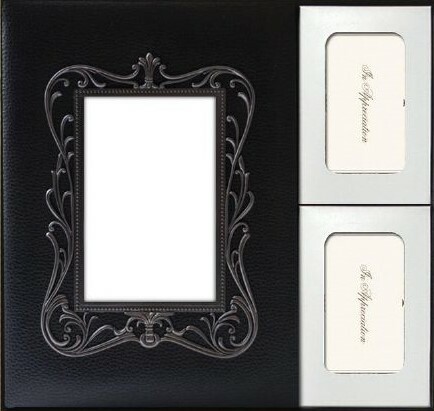 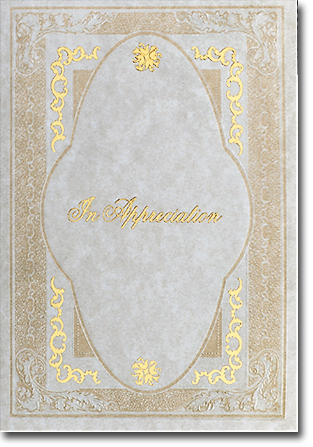 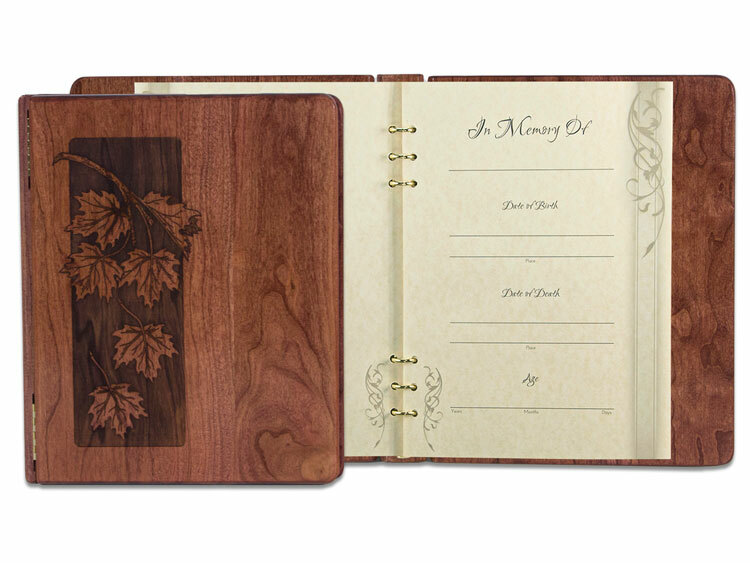 This leather memorial register book features a beautiful ornate picture frame built into the cover where treasured memories of a loved become the main focal point. 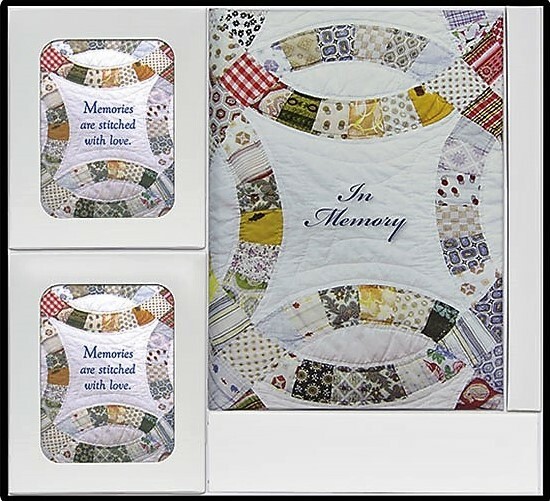 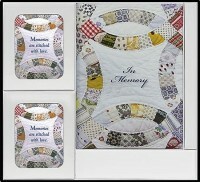 The Quilt Register Book Set is perfect for those who enjoyed sewing and quilting. 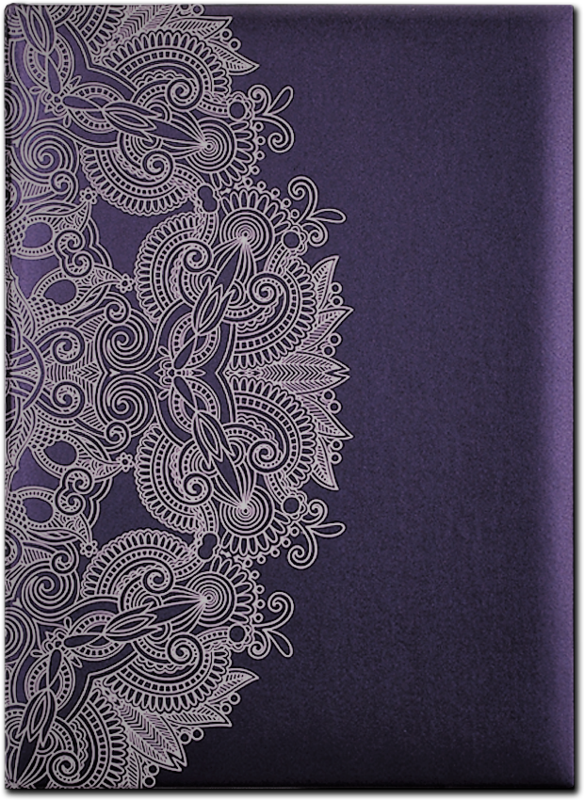 Adorned in intricate pearl foil designs set against a deep purple cloth, Radiance displays an elegant splendor that is reminiscent of all the finest things in life. 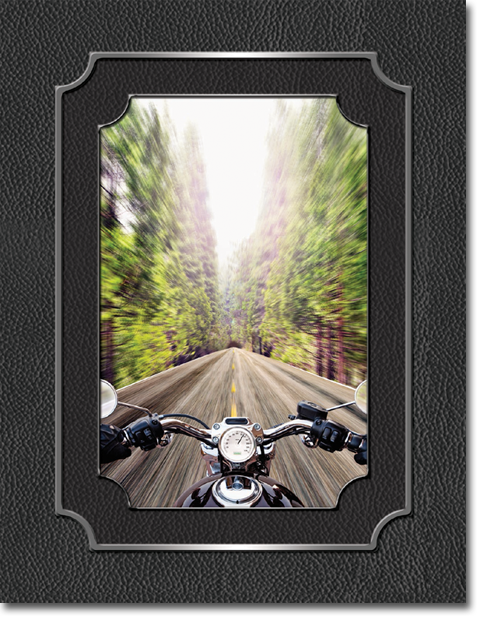 The Riding On series is a fitting tribute to anyone who enjoyed a passion for motorcycles. 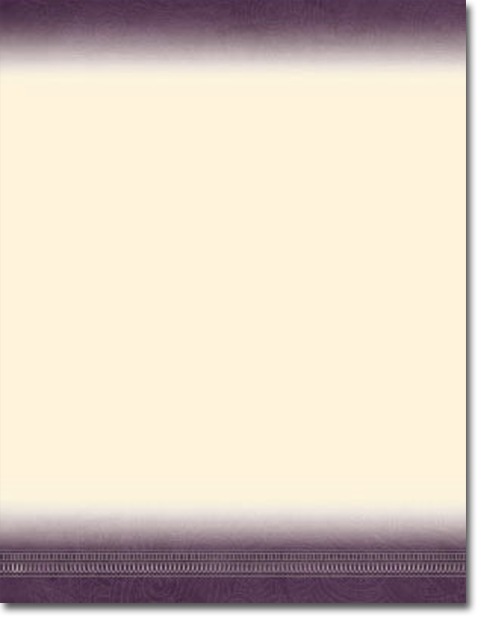 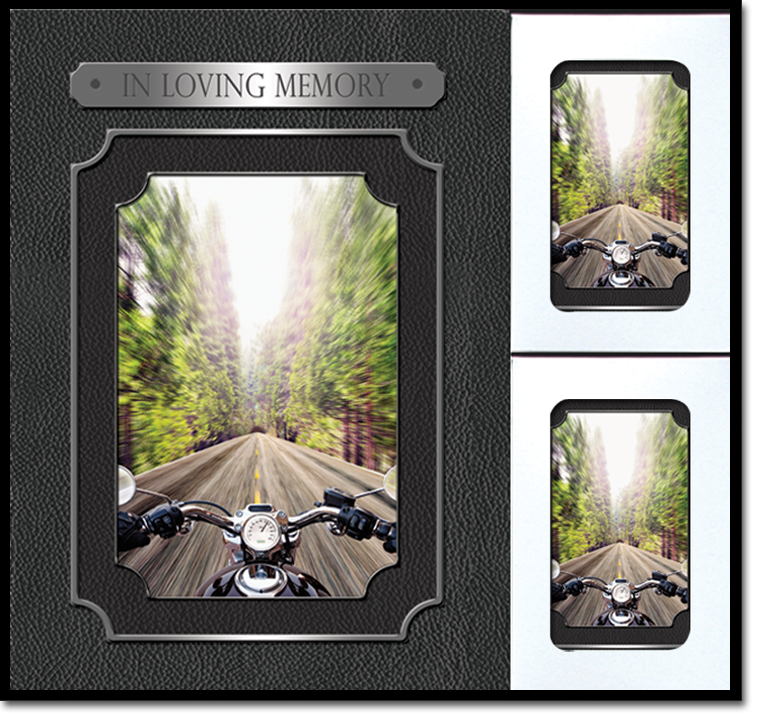 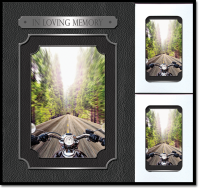 The memorial register book features a full color photograph that brings the vision of the open road to life. 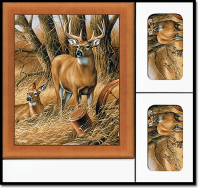 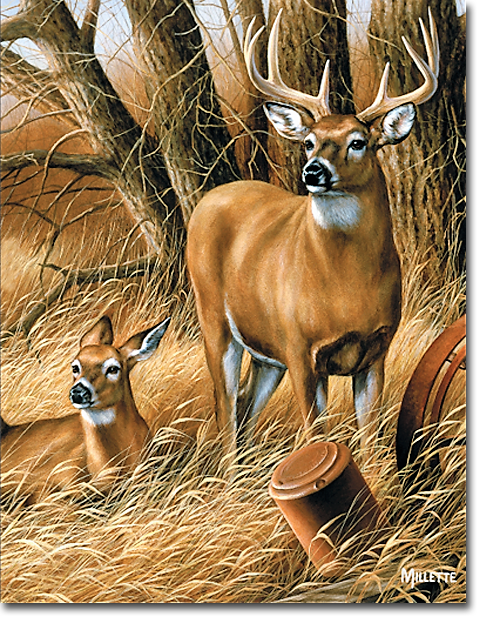 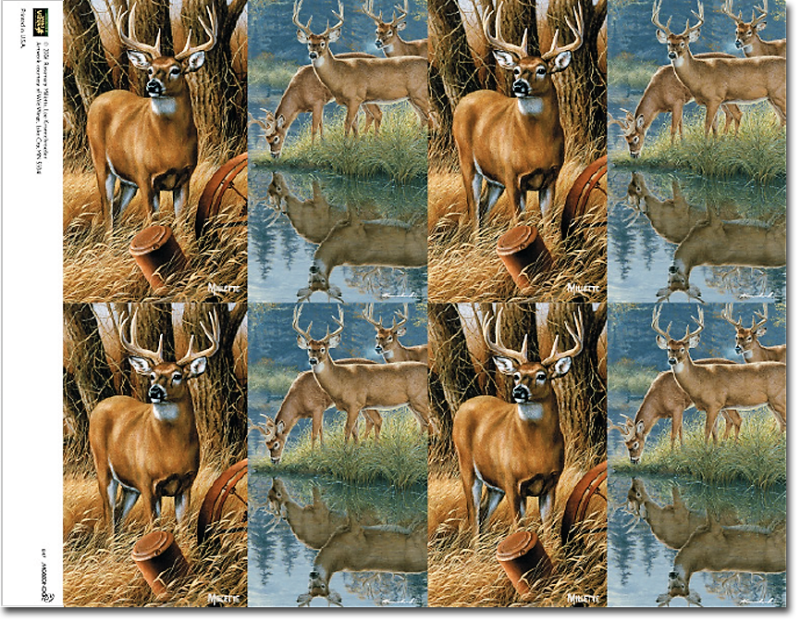 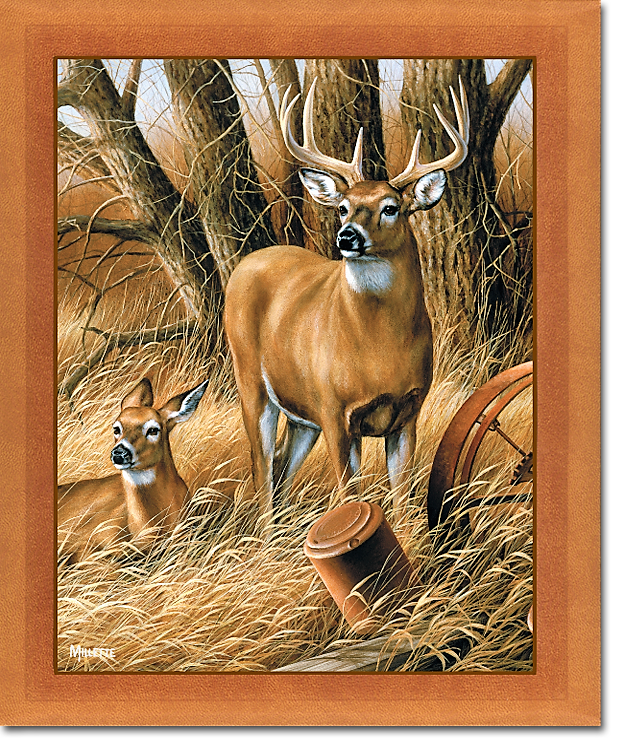 The rustic beauty of one of nature’s most beloved creatures, the North American White-tailed deer, in its tranquil habitat is realistically depicted in original artwork from renowned Wild Wings artists, Rosemary Millette and Lee Kromschroeder. 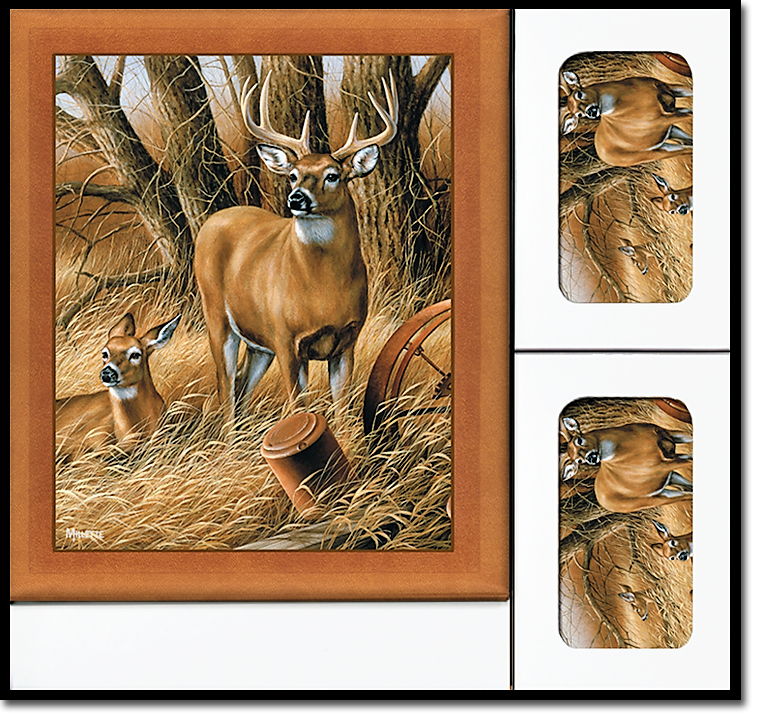 This series is the perfect tribute to nature enthusiasts. 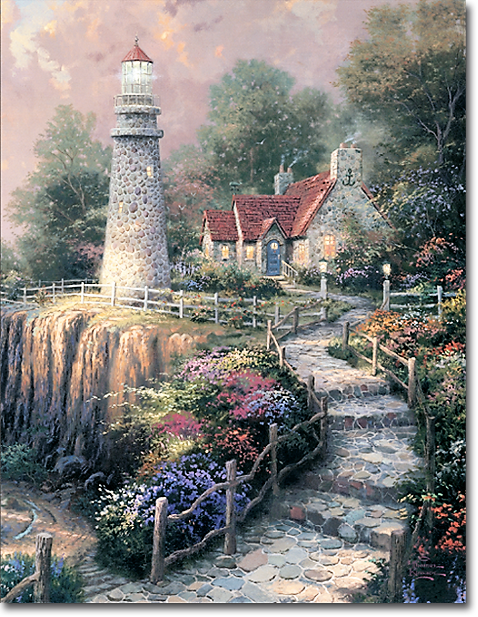 We often sail to distant shores seeking that which lies hidden in our own heart, our own home. 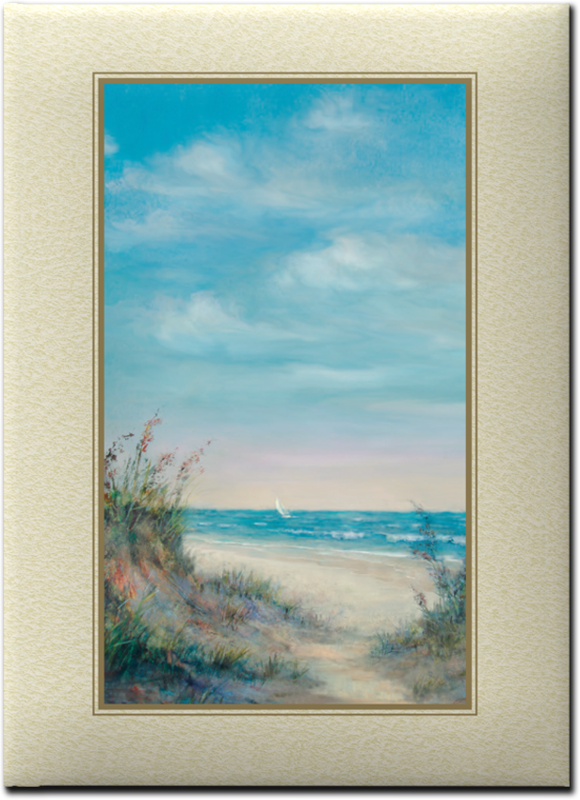 The Sea of Tranquility series captures an inner sanctuary as a golden ocean of light, both warming and refreshing guides you home. 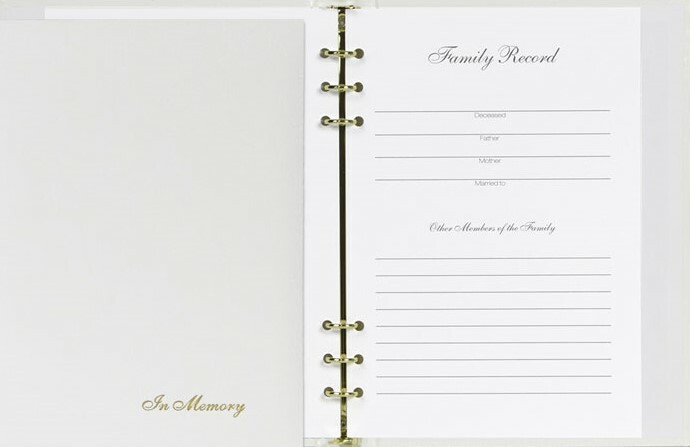 The Simply White Register Book Set is just as it states, very simple and elegant for those desiring traditional stationary. 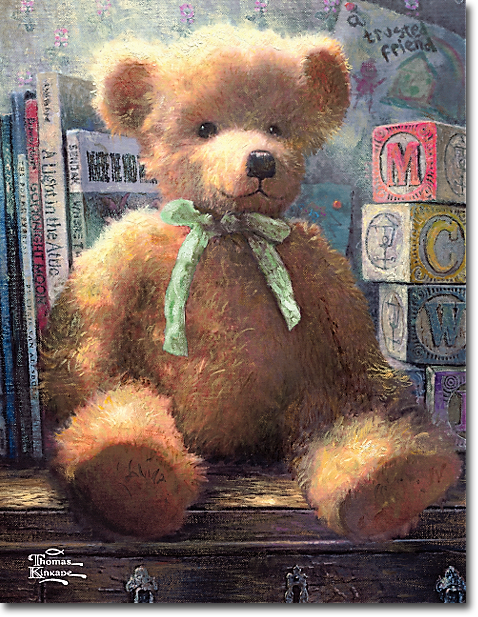 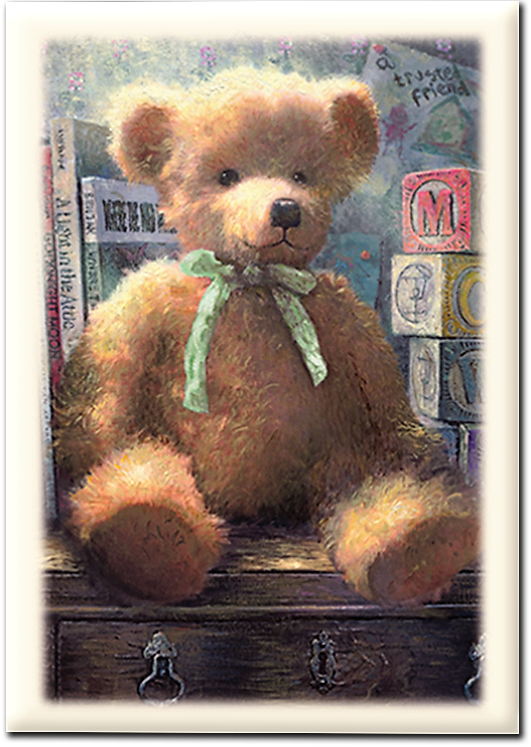 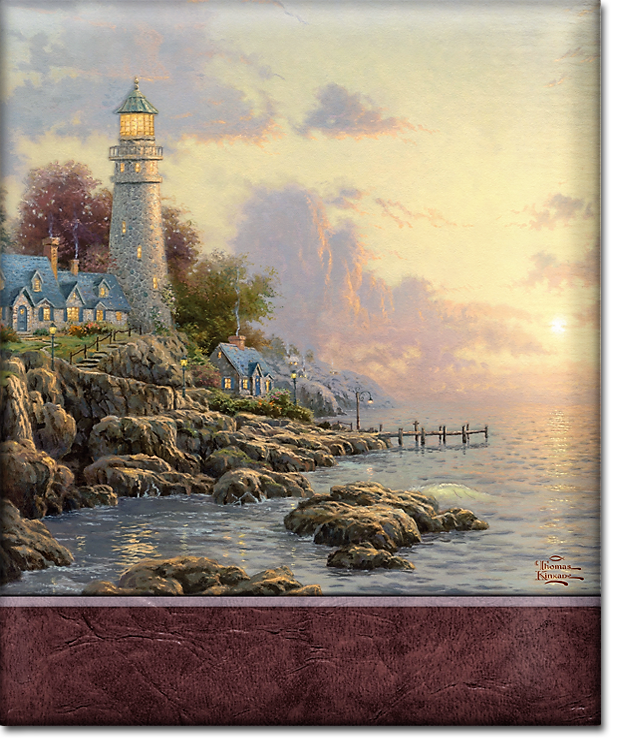 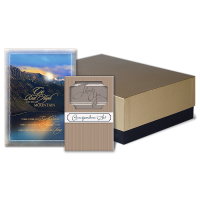 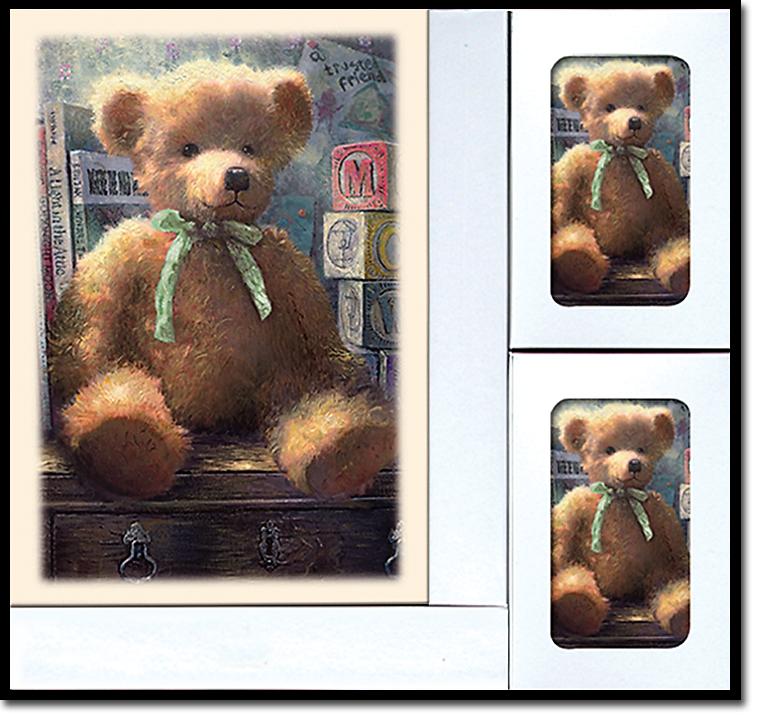 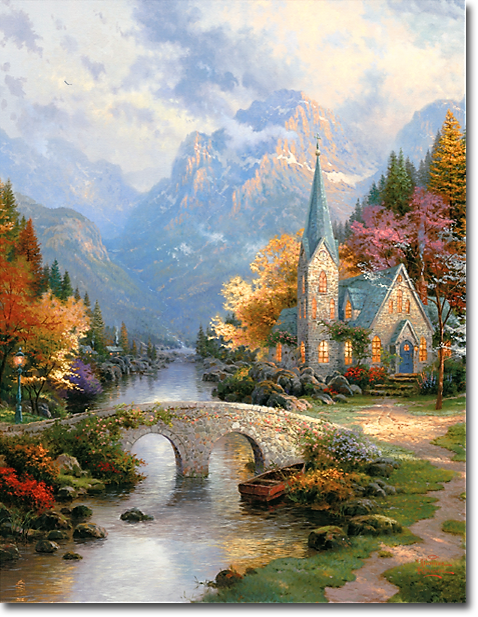 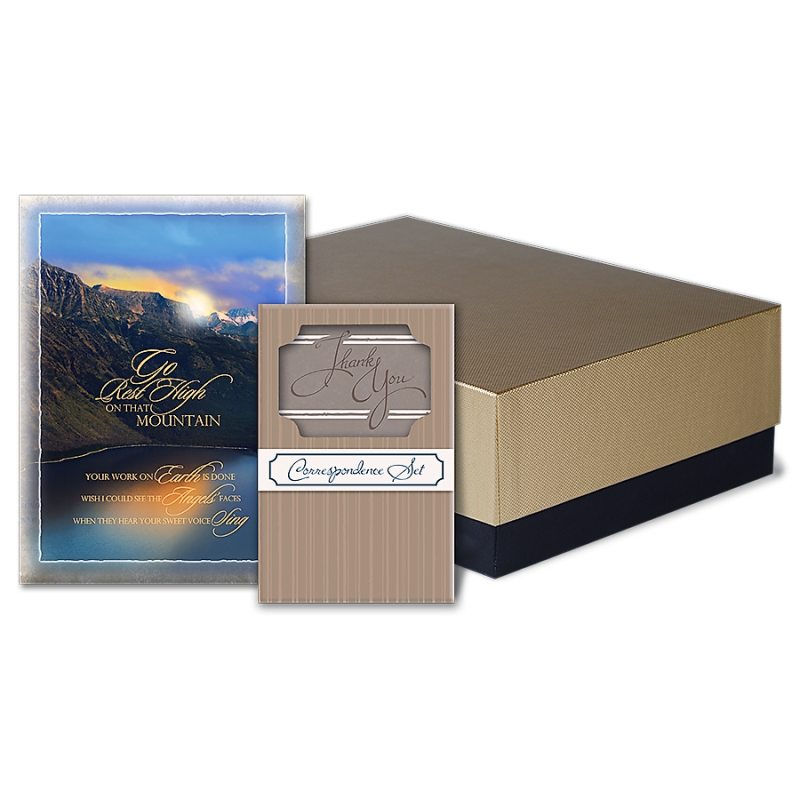 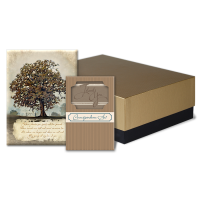 A trusted friend, featuring original artwork by Thomas Kinkade, is by far the most touching children’s bereavement stationary available. 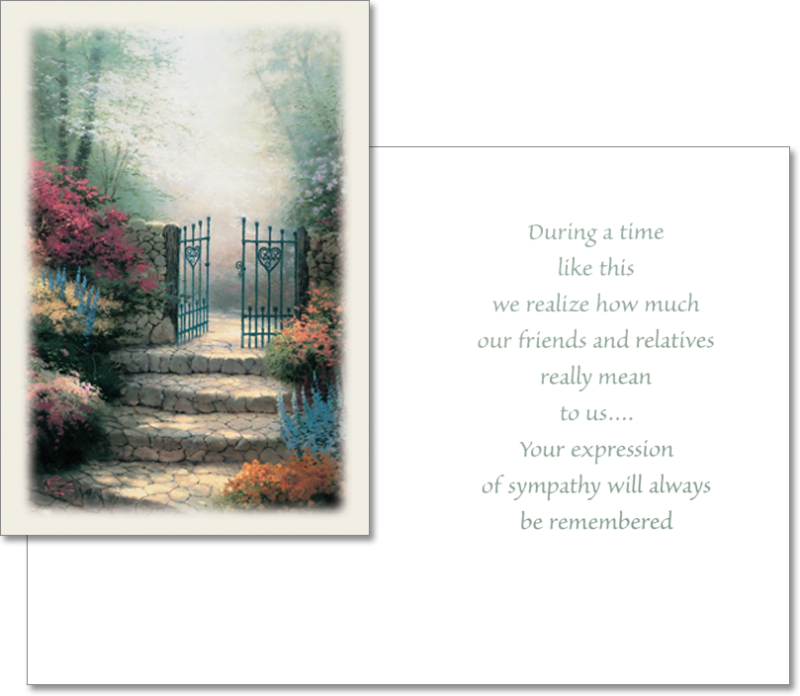 We hope that in some small way, families who suffer such a heart wrenching loss can find comfort with the familiarity of a trusted friend. 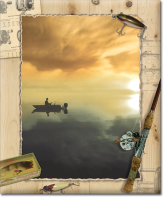 The Water’s Edge book cover shows a wooden rowboat resting on a shore of a placid lake lined with trees. 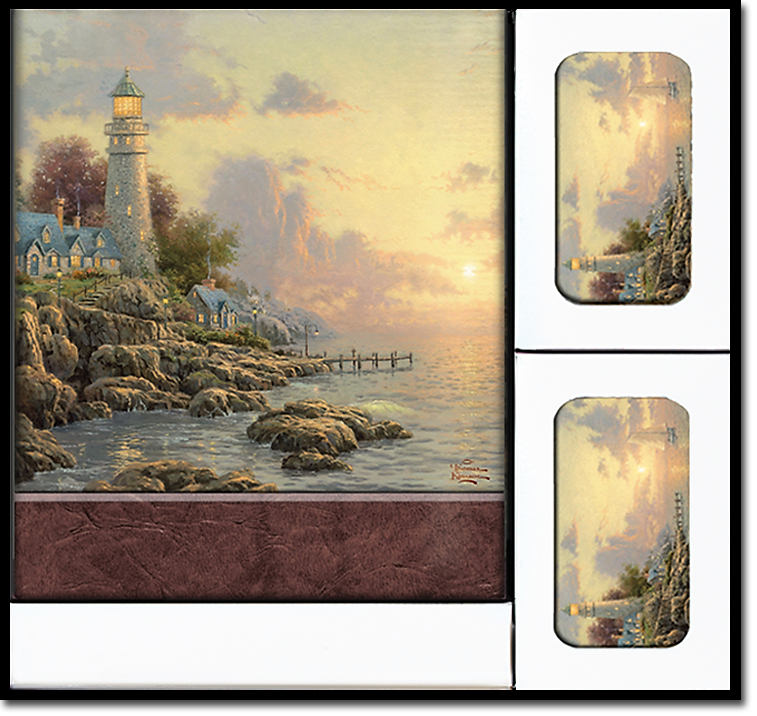 The quiet scene is painted in warm, inviting neutrals, suggesting a secluded place of refuge—a place to heal, to reflect and to heal. Words of comfort are printed on the book along with the art to guide a grieving heart to this peaceful place, sheltered by the trees along the shore. 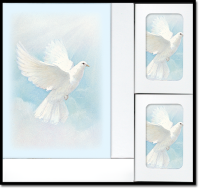 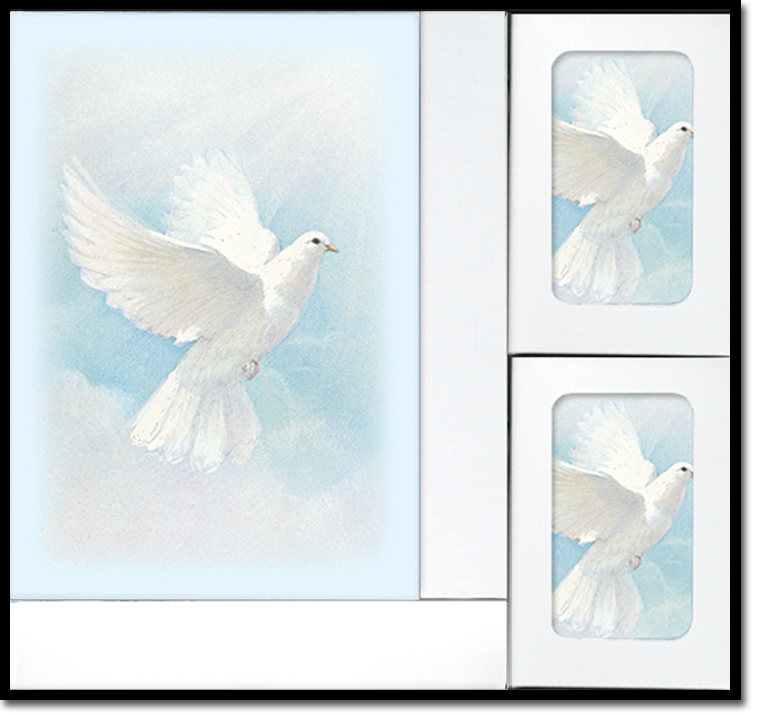 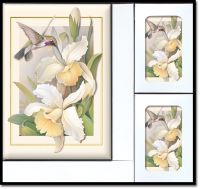 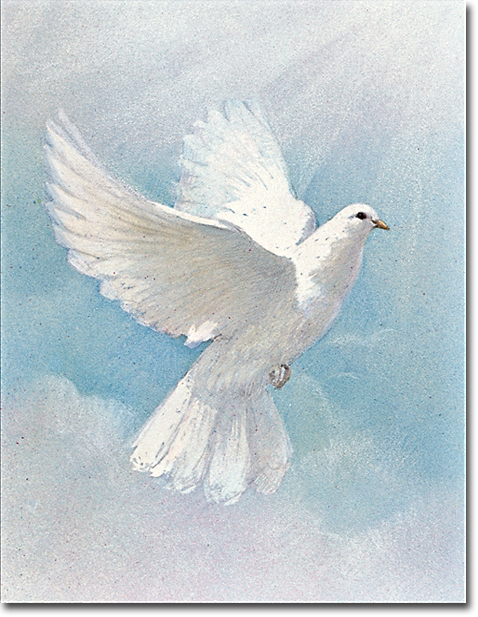 The symbolism of the pure white dove in the White Wing series expresses a universal message of peace and hope and will bring comfort and acceptance to your families.